With two new songs, Kanye West shows his affinity for President Trump and the art of the troll. What a week it's been, too. America's Dad was convicted in a court of law, and we learned just how nasty Nas and Kelis' former marriage may have been after she alleged being physically and mentally abused by him in a new interview. When the unmasking of heroes and villains happens all at once, it can be hard to distinguish which is which. It's the kind of inherent contradiction that lines up perfectly with Kanye's Gemini sensibilities. His latest attention-grabber is a new song uploaded to kanyewest.com Friday night. Titled "Lift Yourself," it comes complete with one of his signature sped-up soul samples — identified as the 1973 song "Lift" by Amnesty — which dissolves into a bare-bones dance house beat before the big reveal. "This next verse though, these bars," he yells, before proceeding to doo-doo all over the track in figurative fashion: "Whoopity scoop / scoop dee dee whoop / whoopty scoopty poop," 'Ye raps, spitting what amounts to straight gibberish. It's a classic head fake from the artist who's prided himself in playing the troll all week long. If there's a proclamation of personal liberty buried somewhere beneath all Kanye's B.S., count yourself as collateral damage in his political provocation. Surely, you've caught snatches from his Twitter highlight reel: the scrolling mix of self-promotion ("You would love a pair of Yeezys. Don't play yourself. "), the dime-store philosophy ("get past the past"), the political contrarianism ("You don't have to agree with trump but the mob can't make me not love him. We are both dragon energy. "), Ye's praise of conservative black pundit and Black Lives Matter denigrator Candace Owens ("I love the way Candace Owens thinks") and the red MAGA hat selfie that made him an overnight darling of the alt-right. It amounts to what many have rightly interpreted as a denial of systemic racism, couched in free-thought rhetoric. But political leverage in the electoral sense is not Kanye's primary motive — it's access to an absolute power and privilege that black boys from the south side of Chicago aren't blessed with at birth. That hasn't stopped him from following the blueprint of a long line of men who've used capital to compromise our national conscience. But his latest inspiration comes straight from the playbook of the Commander-in-Chief. Call it trolling for clout, on a hundred thousand trillion. Late Friday night, L.A. radio station Power 106 premiered another new song from Kanye, featuring T.I., appropriately titled "Ye Vs. The People." The song finds the two of them trading bars back and forth, as Kanye tries to convince T.I. there's a mastermind strategy behind his sunken-place politics. "I know Obama was heaven-sent / But ever since Trump won it proved that I could be President," he raps. When T.I. attempts to reason with him, as the voice of the people, Kanye responds. "You just readin' the headlines, you don't see the fine print/ You on some choosin'-side s***, I'm on some unified s***." T.I. fires back: "It's bigger than your selfish agenda / Your election ain't gon' stop police from murdering n*****." Ye then follows up with an attempt to explain his MAGA hat selfie. "Bruh, I never ever stopped fightin' for the people / Actually wearin' the hat'll show people that we're equal." And later: "See that's the problem with this damn nation / All blacks gotta be Democrats, we ain't made it off the plantation." It's a flimsy equivalency at best — as if Trump's party affiliation is the biggest point of concern for critics within the black community. 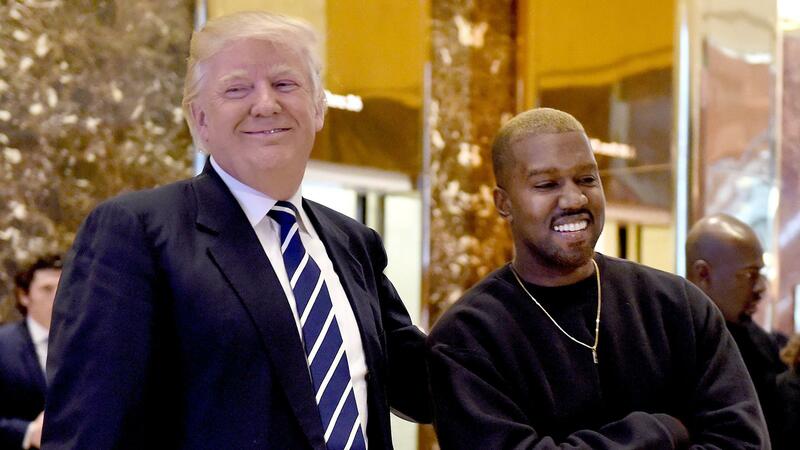 Kanye isn't the only voice in hip-hop to cast metaphorical votes against his racial self-interest, unwittingly or not. To be clear, hip-hop shares some complicity in the rise of the Trump mythology. As Doreen St. Felix points out in The New Yorker, rappers galore – from '90s-era Raekwon the Chef to Lil Wayne — referenced The Donald as a symbol of wealth long before he became the alt-right's candidate of choice. The tune only changed to "F*** Donald Trump," as YG's 2016 protest anthem goes, when Trump laid bare his populist agenda. Contrary to prevailing stereotypes, black folks are equally prone to the pull-yourself-up-by-your-bootstraps myth that masquerades today as law-of-attraction optimism. It's partly why traditional conservative values have such strong grounding in the black community. The idea of rising above one's circumstances is as African-American as sweet potato pie. "Hopped off the Amistad and made 'I'm A God,' " Kanye raps in a recent sampling of new music for TMZ. It's the kind of line that captures his penchant for the paradoxical, but a deeper reading suggests 'Ye sees himself as having transcended systemic racism and the vestiges of the Transatlantic Slave Trade. This isn't new age optimism; it's narcissism. A direct reflection of the ideology he espouses via Twitter, the negative impact is likely to trickle down to Kanye's black fanbase through regressive economic policies rationalized by such logic. Plenty of people have attempted to call him out — from Ebro of Hot 97 to friend and former G.O.O.D. Music signee John Legend. Another protegé and Windy City homie, Chance the Rapper, got caught in the crossfire after coming to Kanye's defense: "Black people don't have to be Democrats," he tweeted. The rapper, whose father worked as an aide to Barack Obama when he was an Illinois senator, quickly came to his senses after President Trump leaped at the chance to use him as a pawn in the effort to discredit his own critics. "Kanye West has performed a great service to the Black community," Trump tweeted, while paying homage to Chance and Dr. Darrell Scott — the black pastor on Trump's early transition team who falsely claimed Chicago gang leaders would "lower the body" in exchange for federally-funded social programs — in the same sentence. "I'd never support anyone who has made a career of hatred, racism and discrimination," Chance apologized in a Twitter post Friday, admitting his original post was a "deflection" from the real issue. "I'd never support someone who'd talk about Chicago as if it's hell on earth and then take steps to make life harder here for the most disenfranchised among us." Kanye, on the other hand, sees himself as a college dropout who bucked the system and graduated to fortune and fame. After being on the bad side of two past presidents – from Republican George Bush, who blamed Kanye for the worst moment of his presidency, to Democrat Barack Obama, who labeled him a "jackass" — Kanye has found a kindred spirit in fellow Gemini and fire-breathing dragon Trump. Among Kanye's last tweets before the weekend began was a bold-faced admittance of his own cluelessness when it comes to party politics. "I haven't done enough research on conservatives to call myself or be called one," he tweeted Friday. "I'm just refusing to be enslaved by monolithic thought." Black Twitter has its own hot takes. One popular meme finds George Bush turning the tables on the rapper who notoriously criticized him during failed disaster recovery efforts following Hurricane Katrina. "Kanye West doesn't care about black people," it reads in a comical twist of fate. History may be a better judge, but for now the joke's on us.